Assorted Mounts for MPCNC Universal Mounting System by karltinsly is licensed under the Creative Commons - Attribution license. UPDATE: These designs are obsolete, or at the very least, very dated. I would recommend checking to see if anyone has made something more recent. I don't think these will fit properly in the current universal mounts for the 525 and other versions of the MPCNC. UPDATE: After using the v4 of the DW660 mount for a while, I have added a one-piece v5 version. It is much more rigid and easier to put on/take off than the two piece version. Unfortunately, it has to be printed with support, but once it's cleaned up, it's a much better mount. UPDATE: Added requested mount for 300W spindle. UPDATE: The DW660 mount is now at v4. I had to create some clearance for the router on the lower mount. UPDATE: I did not like how low my original DW660 mount (QR_660_v2.stl) positioned the tool, so I made a new one that places the tool higher and closer to the x-y axes. 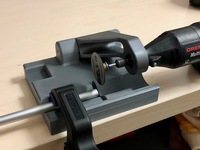 The new QR_660_v3.stl uses both the upper 660 clamp and the kt_660_spindle_clamp. 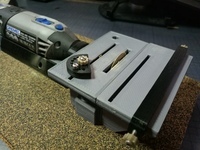 It can be used with PCFlyer's dust shoe. See http://www.thingiverse.com/thing:1091450 for more details. I have not finished printing or trying this yet. I'll post pictures when I do. These are various mounts designed to work with HicWic's universal mounting system for the MPCNC. I printed the receiver part in PLA, and everything else in ABS at .3 layer height, between 50% and 70% infill. The tolerances are very exacting for this system, and I had to use a swiss file and acetone to get everything to fit together smoothly. It took a while, but it wasn't hard, and now everything goes together great. Very solid but easy to slide on and off. I will add more photos once I get the system mounted on my MPCNC and get the various tools installed on their mounts. 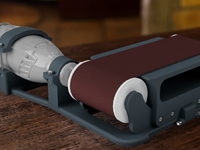 Note that the DW660 mount uses the part "660_upper_clamp" for both the upper and lower mounts, so print two of them. The pen holder is designed to hold a standard sharpie marker. Use the "kt_sharpie_cap" and some rubber bands to apply downward pressure on the pen. Again, I'll post pics once I get everything set up. Thanks to HicWic for a well-designed universal mounting system, and as always, a big thanks to Ryan for the MPCNC! 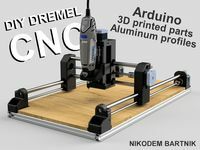 Learn more about the MPCNC at vicious1.com.